Bernelle’s autobiography, The Fun Palace, ends in 1963 when she left the stages of Soho and the West End to raise her family in Castle Leslie, Co. Monaghan. The story of her ‘open’ marriage, single motherhood and success in resuming her solo career remains untold…until now. 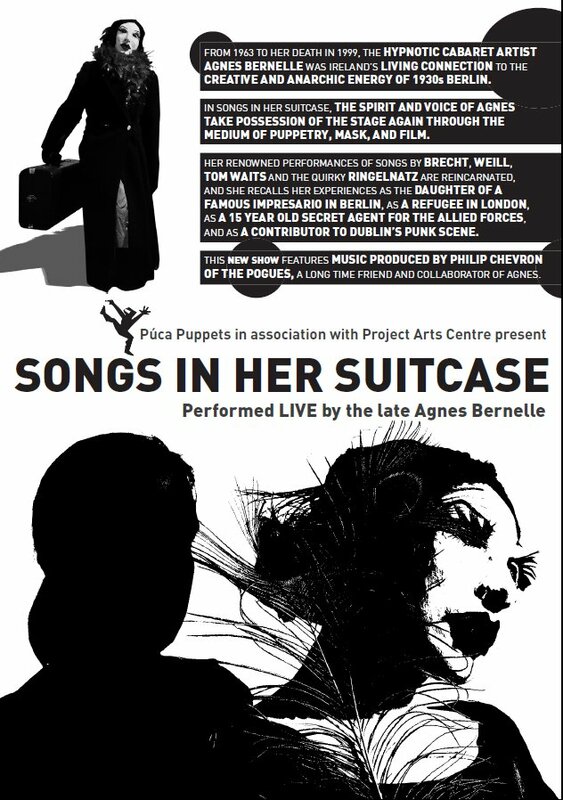 Through an aesthetically ambitious combination of puppetry, mask, documentary and original film images, set design and popular and classical music Púca Puppets, in association with Project, and one of Agnes’ collaborators: Philip Chevron of the Pogues, make it possible for her to return and share some of these experiences, alongside others from her biography – fleeing Hitler’s Berlin; refugee life in London; or her work as a fifteen year-old secret agent for the American O.S.S. 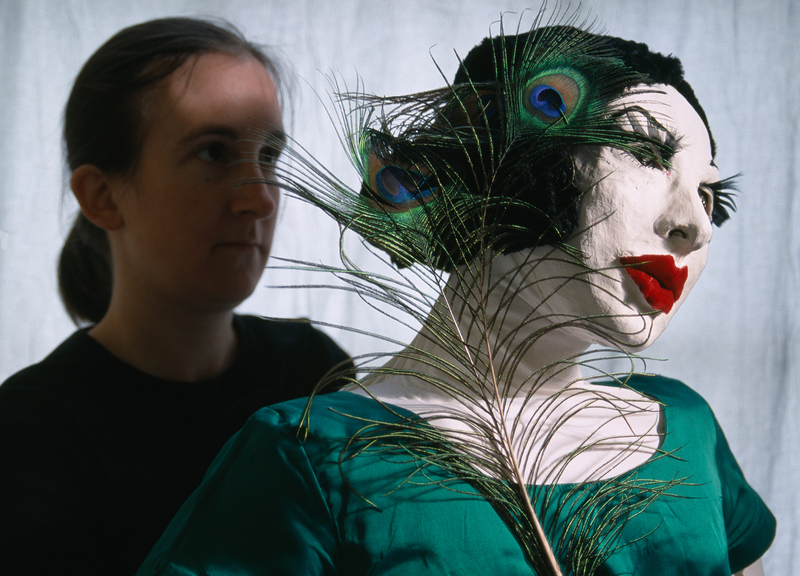 Puppetry makes possible a reincarnation of her fantastic cabaret performances, featuring songs by Brecht and Weill, Waits and the quirky Ringelnatz. Now that she’s no longer bound by the limits of reality, we find her past and present mingle freely with the worlds of song and stage. In assisting Bernelle’s incredible performance from beyond the grave, Púca Puppets continue their pioneering work in theatrical magic realism celebrated in their last show for adults, the acclaimed, Mary Mary’s Last Dance. By Niamh Lawlor, Directed by Leticia Agudo, Musical Director Philip Chevron. 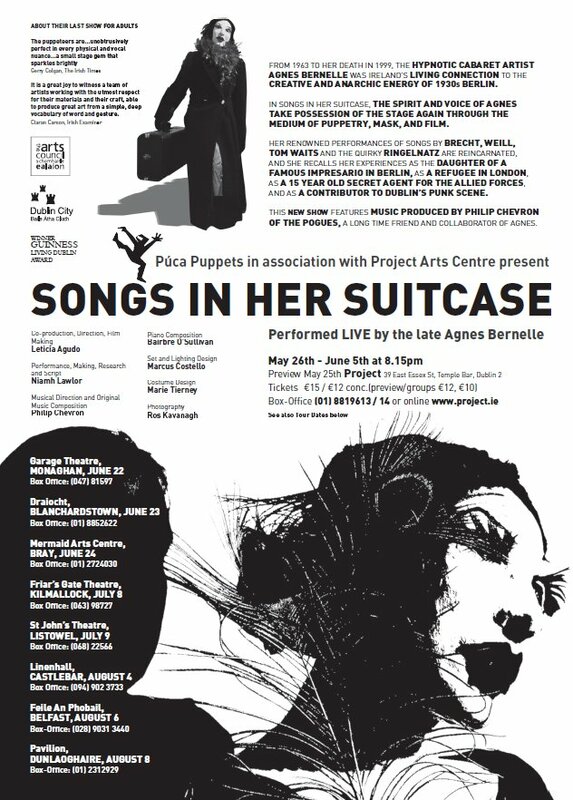 Produced by Púca Puppets, in association with Project Arts Centre. Sound Post-production: Niall O’Sullivan (dqb soundrecording) and Nick Robbins. Dashing Lover with Cat: Maurice Craig himself. Project, Dublin – May 26th – June 5th @ 8.15pm. Preview May 25th.